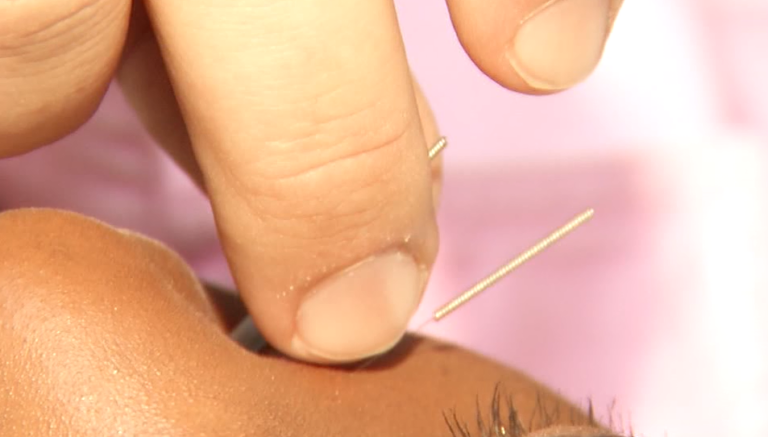 Acupuncture a cure for allergies? Acupuncture is an ancient Chinese practice that targets focal points on the skin using needles. It’s commonly used as a holistic approach to alleviating pain, and now allergies by stimulating the nervous system. Acupuncture essentially activates the immune system where allergic reactions start. Mark Stoehr has been practicing acupuncture since 2009 and has felt the results of it himself. He used to suffer from severe headaches back in college. Acupuncture basically changed his life, but each patient is on their own timeline. Armed with that information, and needles, Stoehr targeted focal points to help with sneezing and congestion. Those points happen to be on the face. He also put a few needles in my hands to access acupuncture meridians. Meridians are pathways that stem from the hand and influence symptoms in the head. I may or may not be cured of my allergy issues, but some people have. In a study published by the American Journal of Chinese medicine, 26 out of 26 hay fever patients reported reduced symptoms after acupuncture, without any side effects. Stoehr says allergy relief is not one size fits all. Acupuncture may work for some and not for others. However, Stoehr says one method that should help most people is a change in diet. Avoiding foods heavy in diary will decrease mucus which is a big help for people suffering from severe allergies.